There was a fair bit of buzz around Eric Hosmer and the Padres this morning after a photo of Hosmer popped up on the Padres’ Instagram account and the team’s Twitter account tweeted “Stay tuned” and tagged Hosmer. The social media posts were all quickly deleted, but speculation took off in fairly rapid fashion (as one would expect). However, the Padres have issued a statement on the matter, revealing that their social media accounts were “inappropriately accessed.” Moreover, Dennis Lin of the San Diego Union-Tribune reports that there’s nothing imminent between the two sides. San Diego and Kansas City have both reportedly made offers of seven years in length to Hosmer, though the precise dollar amount of each deal remains unclear. Lin does note in his report that the Padres did make a nine-figure offer, though, and Padres chairman Ron Fowler has candidly acknowledged that he and his front office have met with Hosmer and made him an offer. Fowler did not explicitly state that the length of the offer was for seven years, though he did reference a seven-year commitment in his comments on Mighty 1090 AM radio in San Diego. Beyond this morning’s bit of drama, the Hosmer chatter has been minimal since Fowler’s comments and the reports of a pair of seven-year offers. San Diego and Kansas City still appear to be the two most serious pursuers of the 28-year-old, and there’s been nothing to indicate that the asking price of Hosmer and agent Scott Boras has dropped significantly despite a lack of obvious suitors. Just like the Orioles did with Chris Davis a couple offseasons ago. Love it when the “Rock Star GM” bids against himself! Boras must be loving this! Why would he bid against himself? The owner put down a good 9 figure offer and the owners have stated this is what we feel is fair and a good offer. The offer will not go up. Everyday Hosmer doesn’t sign his pay day goes down. My bet is he signs a 1 or 2 year deal. Padres talk is only because they are the only team in need of a first baseman. Hosmer needs to go to his closet and dust off his royal’s uniform because that is where he likely ends up. Depends on his contract he could sign a 2 year deal the second year lets him opt out of the deal. In case of injury its a insurance policy. Padres the only team that needs a first baseman? Wil Myers…the only other long term contract on the books for the Padres. Positionally Hosmer makes zero sense for the Padres. What? I don’t think you understand. Even though the Padres already have a long term first baseman, doesn’t mean that they don’t need another long term first baseman. Look at it as if you were buying a dog, you can never have enough and you can never go wrong on getting another more expensive dog. It’s not necessarily that you’re replacing your first dog, it’s just that you just happen to love dogs in general. So, I think it logically makes 200% sense on the Padres getting another dog I mean first baseman. Wow, what type of logic is that…..we have a first baseman but we want to sign another long term for a ridiculous amount of money just because? Speaking about dogs…..this argument of yours for doing something this stupid has lots of fleas there Dude! Also, Will Myers contract balloons after this year. If he has a good year, and proves his versatility in LF, he’ll be a someone we can trade. He can’t be any worse than last year, was a gold glove finalist in 2016 at 1B, used to play center, came up as a catcher, and can be a 20/30 player at still affordable contract of $22 mil a year. We’d most likely have to eat some money, but I’d rather have Hosmer at first than Wil. But signing Hosmer make sure better at two positions. 1B and left. Pirela was awesome last year over a half season, but he’s 28, a career minor leaguer, and not in our long term plans. Tell me Dude…..if you have a player like Myers that actually plays well regardless of his versatility or lack of……why the hell are Padres fans always calling for him to be traded? No wonder your cellar dwellers! 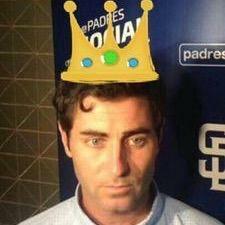 Padres would have to attach someone like Baez or Quantrill to Myers to trade him. His trade value is in shambles. Hey! Don’t knock that 25 year rebuild plan the Padres are working on ! I was about to type the same thing but you beat me to it. Not that much negative value. I bet it wouldnt even take that. Hosmer s numbers will drop like a sinking ship in San Diego, he should reconsider if this is true. He has 25 career plate appearances at Petco, his numbers are impressive but wonder about how sustainable that can be over 300 plus times at the plate. All 34 career at bats? I’ve always wondered when FAs take so long to decide on a team, if they actually like going where they end up when they could have selected the same team months prior. Like if no team ups their offer, will Hosmer have any resentment? His met is a solid player but surely not someone you’d lock in for 7 years? If they are really offering that he jump before they have a chance to think about what they are doing. It makes you doubt the Padres being relevant anytime soon. What a strange offseason. Can’t believe all this is still going on and basically all the top free agents are still unsigned when we are only a few weeks away from pitchers and catchers reporting for Spring Training. When you put pizza on a bagel, you can have pizza anytime. San Diego would be a wiser destination than Kansas City for Hosmer. The Padres are beginning to trend upward and Kansas City looks like they are about to enter a rebuild. In KC he has legacy that he can continue and usher in a new age. His numbers will be better than at Petco and might even have a better chance with less talent on KC considering the NL West he would have to compete against. NL West isn’t that strong. Sure the Dodgers and Rockies will be good for a while but so will the Indians and Twins. Diamondbacks are about to lose all their best players to free agency and have no farm system and the Giants are starting to creep in the direction of the 2014 Phillies. Yet another very articulate, well thought out comment from padreforlife. he’s not better than Santana, just younger. So maybe you go 4/80 instead of 3/60. That’s about it. Yeh….with a 6 year deal, he’ll only be 39 at the end “should still have good value at the end”? Really, that’s what the Yankees said about A-Rod and look at what they got for the last couple of years. You’re dreaming if you think this guy is going to offer “good value” at the end of a 6 year contract he signs at age 33 to begin with. And all you Padre fans keep talking about is “moving” all these team guys”. What’s up with all this? Is the glass half full or half empty? Hear that knock at the door…..that’s reality calling! Go look up his age please. I don’t understand his hesitancy for SD. Great place to live and will contend in a few years if their prospects live up to expectations. He must have a dream team in mind that hasn’t offered anything yet. If it’s about the money I’m sure he has the top offer in hand already. Or they can keep lowering the offer until he accepts it! I think he’s waiting for KC to match the Padres offer, cuz he really wants to stay in KC! Why would you want to play there? The Royals will duke it out with the Marlins and Tigers for the #1 draft pick in 2019 and those two teams are at least finally starting to rebuild. And how are they looking for the future? Exactly. You refuse to answer the question because you can’t without admitting I am right. You’re a joke. Why would the Padres do that? Seriously, pass on Hosmer. Idk why we are looking to move Myers back to the OF. If anything why not move Pirela to 1st instead of signing Hosmer. We should have sign Matt Adams given his ability to mash RHP if we were looking for a 1B. Id rather the Padres keep the picks (theyd lose for signing Hosmer over 50 mill) and IFA money- doesn’t their penalty for going over their spending in 2016 reset in 2019? Or do they take the picks and IFA money come out of this signing period? You only have to forfeit IFA money if you didn’t receive revenue sharing. I’m pretty sure the Padres did receive revenue sharing. Not 100% sure tho. Thanks for the clarification. Not 100% sure on the new rules. Still, i dont see hosmer being a superior upgrade to myers and putting myers in the OF means we wouldnt have a spot for jankowski or cordero. Personally, im hoping cordero locks down the spot in LF cause him and margot would make a great 2/3 outfield which would improve renfoes defense to not cover as much ground. But if jankowski or cordero could lock down LF itd help. Where there is smoke there is fire… As a Padres fan I am torn about the idea of Hosmer on the Padres. On 1 hand I think he’d help the team now and the future but on the other he will limit their financial flexibility in the future so the money might not be the best place to put it. I just don’t see the fit with Myers already there and Josh Naylor being a thing. If you wanna waste money, waste it on a shortstop. Naylor’s gonna be the next Dmitri Young dude. Hosmer’s better. As a Padres fan I’d be so happy if the team stopped with this ‘signing Hosmer’ stuff. Use that $ when you have a team that’s ready to compete. With all of our great prospects coming up, making the minimum, we will have plenty of money to spend. Why not use it on, young veterans w leadership and championship pedigree? The only FA we should go after next year is Kuechel, and we probably won’t be able to get him. Spend money now, you’ll still have Hosmer in his prime in a year or two for the competitive team. Padres fans get mad when we don’t spend money on free agents, and mad when they do?? da fuq. He checks all the boxes of what we need. Three years ago when they signed James Shields they talked a bunch about his “leadership” then not even two years later when he was traded everyone was calling him a “clubhouse cancer.” If Hosmer doesn’t perform the same thing will happen to him. I didn’t know he plays shortstop. I like the idea of signing Keuchel a lot more than signing Hosmer. They already have a first baseman in Myers, so singing Hosmer and forcing Myers back out into the outfield does not sound like the ideal situation. I don’t think Keuchel is gonna be worth the money when he hits FA though. Erik Bedard ring a bell? Unfortunately, if you’re a small market team, most aren’t worth the money. It’s a big risk to sign any top FA’s long term. I think Hosmer will age nicely tho. Front load his contract, so if and when he starts to decline, you can move him easier. Myers would be an excellent LF. But not sure if he’s going to be in our long term plans anymore. That’s why we backloaded his contract. It makes SOME sense for the Padres to try and spend money now. With one of the top ranked farm systems (though most top rated prospects are still 2-3 years from contributing), it would be nice for them to come to the big leagues, not taking up too much salary, and be surrounded by talent. If the Padres wait until next year, they will be bidding for services of machado, Harper, kershaw (possibly), and others in what is expected to be one of the biggest free agent classes to date. The Padres won’t be able to spend with other clubs during that. No chance. So I guess it makes sense to spend now, while other teams are saving their spending for the following year. But I wouldn’t be spending on Hosmer. I would have liked to see an investment in shortstop. Padres fans are all hyped on tatis jr (and for good reason)… but he seriously hasn’t played above LOW A BALL!!! Please do not be excited over the minimum at bats he received as a late call up to AA. As much as I REALLY hope tatis jr pans out to be the prospect Padres fans are hoping for, I think to automatically assume he is the shortstop of the future, without playing a season at AA or even high A ball yet, is very premature. And if my concern turns out to be wrong and tatis is the stud he looked like in Fort Wayne, then he can slide over to third base, where many reports have him eventually ending up anyways. Third base hasn’t exactly been an easy position for us to fill either… wouldn’t have minded 2 years from now, seeing cozart, tatis, urias, Myers in the infield. Padres dont need Hosmer. Adrian Gonzalez should have been in there radar. Padres should spent money on next years free agents. Manny Machado should be more worth then Hosmer for plus 5 years. Hosmer numbers are only good because he plays 150 plus games with 500 plus at bats. He does not hit for power. He just gets more chances at batting for homers and rbi’s. Padres should go for J.D Martinez, he could be the next good aging Cruz from the Mariners. Only go for Martinez on a 4 year deal with a option for a 5th with a buyout in case if he doesnt have the same production. Martinez would be good at around 20-25million a year since hes only been good the last 5 years. Reminds me a lot Nelson Cruz but can run faster. Yeah, because the padres are known for handing out $100M contracts. The padres, rebuilding since 1969. If you take all the clubs across MLB that were in existence in 1969 up to now, the padres have the worst overall record. Literally, the worst team since their inception.